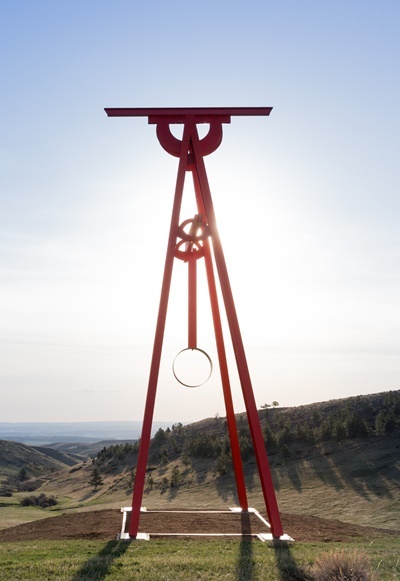 Report: On a sprawling tract of ranch land, two philanthropists have brought together grand-scaled sculpture and intimate music. FISHTAIL, Mont. – On the high rolling hills here in south central Montana, on a vast spread of land within hailing distance of Yellowstone, an artistic convergence has come to pass in the most improbable of forms: Beethoven has met his second self. 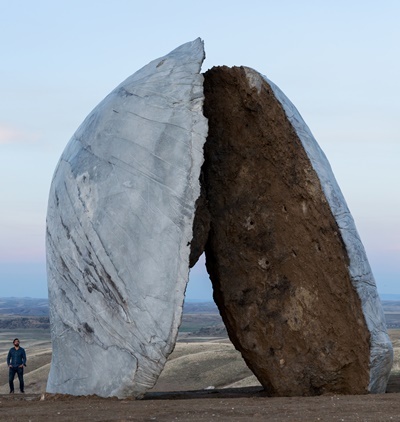 In the opening flourish of the Tippet Rise Art Center, recently established on 11,500 acres of a working cattle ranch in the shadow of the Beartooth Mountains to the southwest, the sound of a Beethoven string quartet fills an intimate, elegantly crafted concert barn. 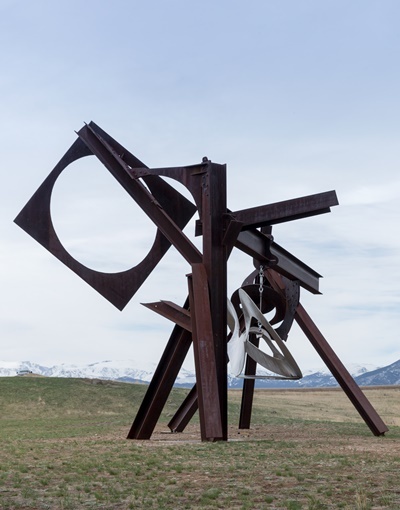 And just up a winding gravel road, inspired by that music, sculptor Mark Di Suvero’s outdoor-scaled work “Beethoven’s Quartet” offers visitors an arresting sense of visual harmony – though you can also pick up a mallet and strike the sculpture to create a song of yourself. These interlocking aesthetic spheres, which extend across a variety of grand, meticulously placed sculptures and an assortment of musical offerings, are the brainchild of arts philanthropists Peter and Cathy Halstead, who picked this spot to create a rare melding of performing and visual arts. 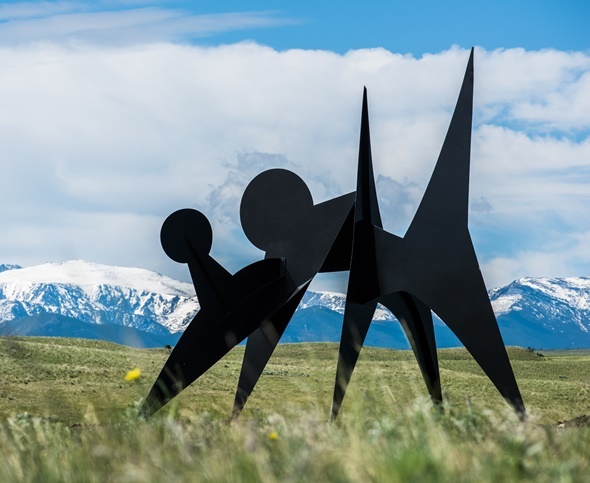 Its proximity to Yellowstone, along with its artistic riches, makes Tippet Rise a natural stop for vacationing Chicagoans. The art center lies just to the south of Interstate 90, about equidistant between Billings and Bozeman. 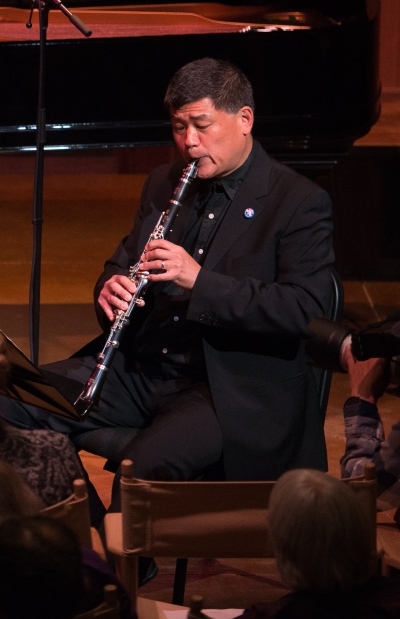 Amid the high-powered first wave of artists invited to participate in the chamber concerts that define the center’s musical offering was clarinetist John Bruce Yeh, a longtime member of the Chicago Symphony Orchestra. His spotlighted performance in Messiaen’s “Quartet for the End of Time” proved to be one of the consummate moments of the three concerts I heard during a packed weekend at Tippet Rise. The Halsteads’ venture springs directly from the heart. She is an abstract painter. He is a poet, photographer and pianist. Their history of arts philanthropy is long and distinguished. They are trustees of the Sidney E. Frank Foundation, which makes more than 90 grants annually to charities in the U.S. and England. 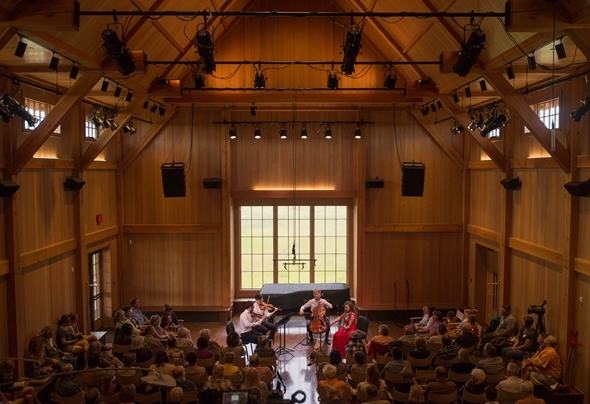 Beneficiaries include the Juilliard School, the Manhattan School of Music, the Curtis Institute of Music,the San Francisco Symphony, and the Aspen and Vail Music Festivals. In England, grants have gone to the National Theatre, the Royal Shakespeare Company, and Shakespeare’s Globe. The couple have traveled the world to experience the arts in all their diversity, and in settings that became the models for Tippet Rise – notably the Storm King Art Center, a 500-acre sculptural park in New York’s Hudson Valley, and the celebrated acoustics of Snape Maltings Concert Hall in Suffolk, England, centerpoint of the Aldeburgh Festival founded by Benjamin Britten and Peter Pears. To refine and nurture his venture, Halstead hired Alban Bassuet as executive director. A designer and acoustician well acquainted with the performing arts, Bassuet was trained at IRCAM in Paris and worked at the London-based firm Arup, which developed Snape Maltings. Halstead views the center’s seemingly endless tract, which the couple assembled from the purchase of several contiguous ranches, as a blank canvas. “We didn’t want just a pretty ranch,” he says. “We were looking for openness, mystery, grandness of scale, a feeling of being so close to the sky – the kind of place where the music of Scriabin or Messiaen’s ‘Quartet for the End of Time’ would seem to resonate. That connection of earth to endlessness, of the finite to the sublime, is inherent in the natural prospect here. And it is echoed palpably in the massive sculptures that both punctuate and flow into the center’s tremendous vistas. The Halsteads said they wanted only “a certain kind of sculpture,” which led them to install or commission formidable works by the likes of Di Suvero, Alexander Calder, Patrick Dougherty and Stephen Talasnik, as well as three creations by Spain’s Ensamble Studio that are literally fashioned from the earth – by scooping giant holes and filling them with concrete, then extracting the massive forms and raising them up as a pair of earth-shaped monoliths that stand in mutual support. In good weather – or at any rate, in what begins as good weather – performances are given outdoors amid the sculptures. Sometimes, nature pulls a fast one: Cellist Matt Haimovitz was nearly through such an al fresco performance of the Bach suites (each preceded by an “overture” commissioned from composers Du Yun, Vijay Iyer and Roberto Sierra) when a suddenly developing storm chased everyone to a more conventional venue. 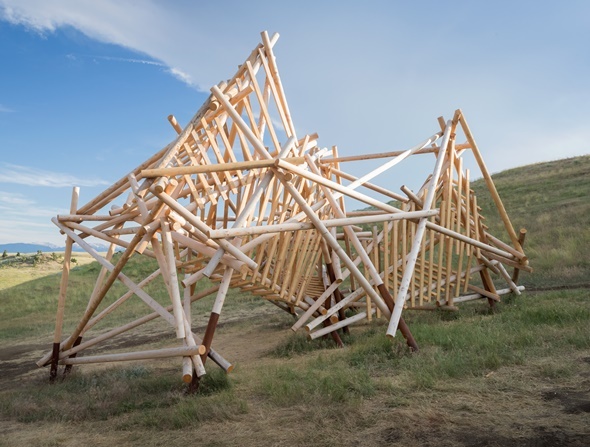 At Tippet Rise, the usual performing space is the Olivier Barn, a cozy, serene room lined with larch wood, its ceiling rising in a steep slope. The Barn seats about 100 and affords agreeable acoustics, which I experienced from several different perspectives in concerts by musicians of the first rank. A slew of virtuoso pianists dot the Tippet Rise roster this inaugural year, starting with the center’s music director, Christopher O’Riley. The list includes the French pianist Lucas Debargue, Italian pianist Alessandro Deljavan, Stephen Hough, Tchaikovsky silver medalist George Li, and Russian stars Nicolai Demidenko, Svetlana Smolina, Yevgeny Sudbin, and Konstantin Lifschitz. Scarcely less impressive is the lineup of pianos that Halstead and O’Riley have acquired to serve their stellar guests: a dozen very fine Steinways, some of them famous.The prize is surely the instrument that once was Vladimir Horowitz’ personal favorite, the Steinway CD-18. 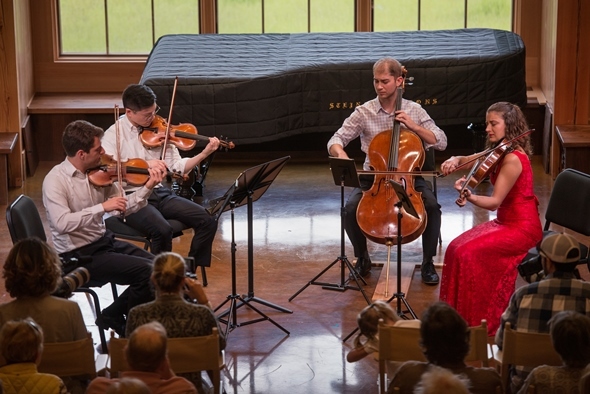 The Dover Quartet made the Beethoven connection with Di Suvero’s sculpture in a concentrated performance of the String Quartet in A minor, Op. 132, then teamed up with Haimovitz for an electric turn through Schubert’s String Quintet in C major. 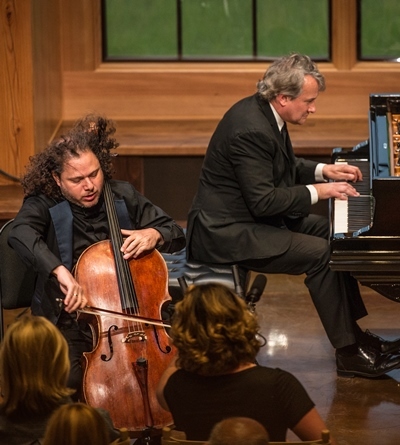 In a concert of cello sonatas that included works by Shostakovich and Prokofiev, Haimovitz and O’Riley delivered an impassioned performance of Rachmaninoff’s Sonata in G minor not soon to be forgotten. 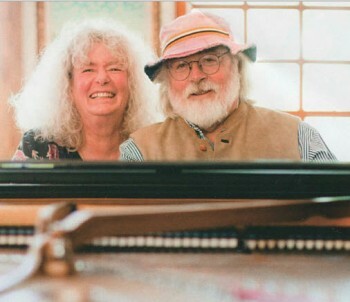 A third program was devoted entirely to music of Messiaen, starting with the prodigious and rarely encountered “Visions de l’amen” for two pianos, a fiercely involved reading by Svetlana Smolina and O’Riley. He then joined violinist Caroline Goulding, Haimovitz and the CSO’s Yeh in a performance of the “Quartet for the End of Time” that spoke eloquently of this remarkable place — where gentle hills make graceful conjunction with the mountains, and the mountains modulate into a harmony beyond time, in the cosmos, in the music of the spheres.